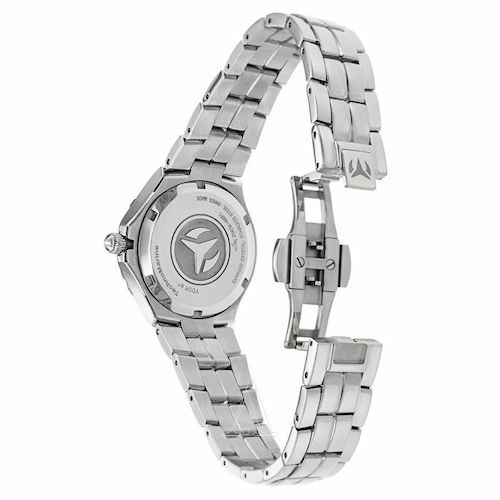 Uni-directional rotating stainless steel bezel set with diamonds. White dial with silver-tone skeleton hands and Arabic numeral hour markers. Dial Type: Analog. Date display at the 6 o'clock position. Solid case back. Case diameter: 34 mm. Case thickness: 11 mm. Band width: 20 mm. Deployment with push button release clasp. Functions: date, hour, minute, second. Casual watch style. 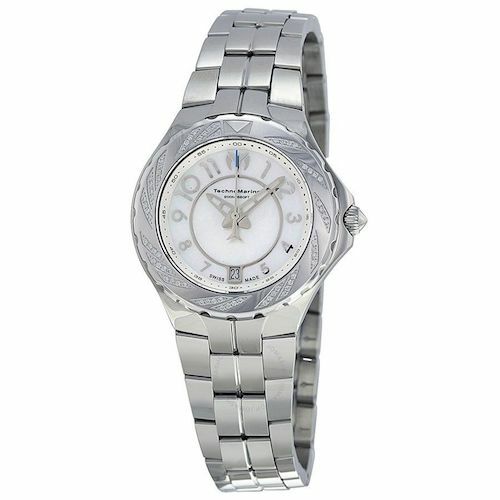 Technomarine Sea Pearl White Dial Stainless Steel Ladies Watch 713004. Shipping & Handling: Free shipping within the contiguous United States. If shipping to Alaska, Hawaii, Puerto Rico, or Canada $30 additional.